There are three accounts you’ll need to make Google Shopping work for you: AdWords, Google Merchant Center, and Google Analytics. If you’re the type who likes to roll up your sleeves and start working immediately, then here’s a quick walk through on the basics of setting up all three accounts. The real magic happens in building your feed, creating a bidding strategy and then monitoring and optimizing. If you want to see the bigger picture first, skip to the Feed Mastery section and then come back to this account set up section. Manually–by entering your product information into a spreadsheet according to Google’s specifications. By using an extension, plugin, app, or service that pulls data from your site and formats it in a way Google likes. We’ll discuss the pros and cons later, for now, here’s how to create your Merchant Center account. To get started visit www.google.com/merchants and click sign up. Here are a few tips in setting up shop. Have access to your domain registrar - You’ll need to verify that you own your site and then claim it for use in Merchant Center. The easiest way to do this is by logging into your domain registrar and giving Google access. This can all be done directly from Merchant Center. Know your tax and shipping settings - Under General Settings in Merchant Center you’ll need to set up both tax and shipping rules. For sales tax you can enter your rates directly or pick the states you charge sales tax in and allow Google to determine the rate. For shipping you can choose between a flat rate (which could include free shipping), carrier-calculated based on the carriers you use, or based on a rate table or rules. 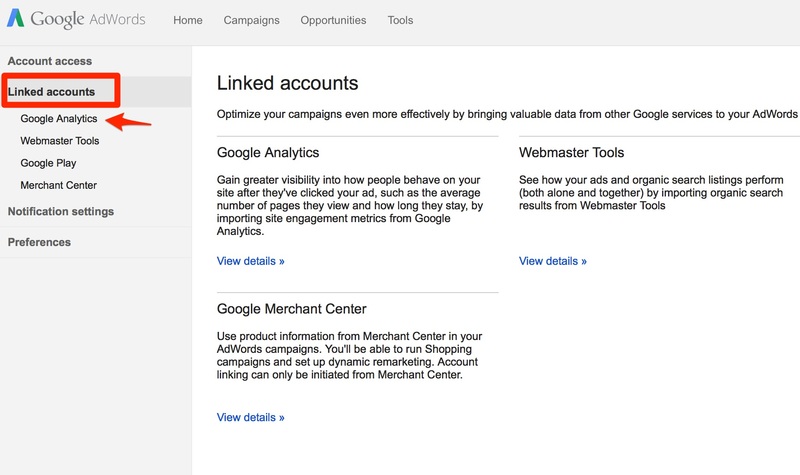 Link Merchant Center to AdWords - Under “Settings” and “AdWords” click to link to your AdWords Account. You’ll need a 10 digit AdWords ID in order to link the two. 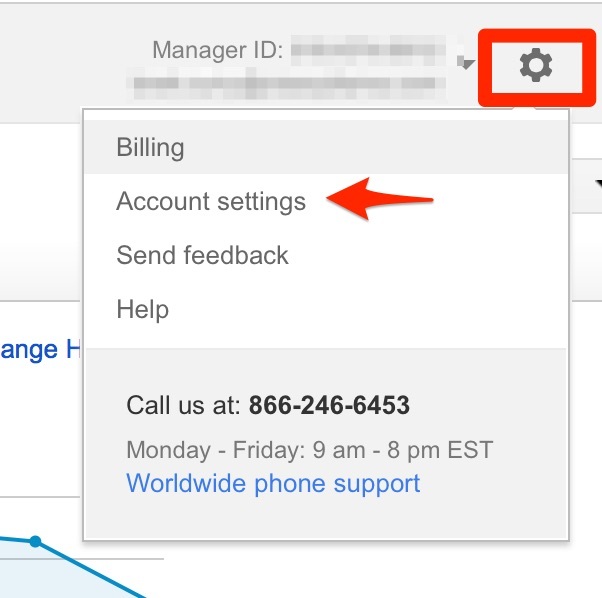 Also, you’ll need to be logged in with an email address that has admin access to both Merchant Center and AdWords. This guide is focused on Google Shopping, so I won’t go into detail in setting up an AdWords account. There is a great guide for setting up an AdWords account here. Here are just a few tips though in getting the basic settings in place for running Google Shopping Campaigns. Name Your Campaign, Choose your Country, Choose Your Priority. Pretty straightforward, but naming is important if you plan to have multiple campaigns, which many merchants will (maybe for seasonal reasons or for testing purposes). You have the options of setting your campaign to low, medium, or high priority. Changing the priority is only important if you have multiple campaigns. The default priority is low, which is fine for your first campaign. 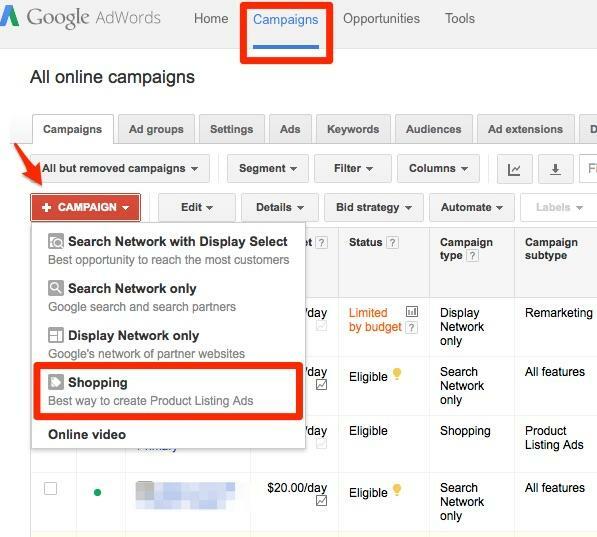 If you run multiple campaigns and if you have the same product advertised in multiple campaigns Google will decide which campaign (and it’s corresponding bid) will show up in search results. 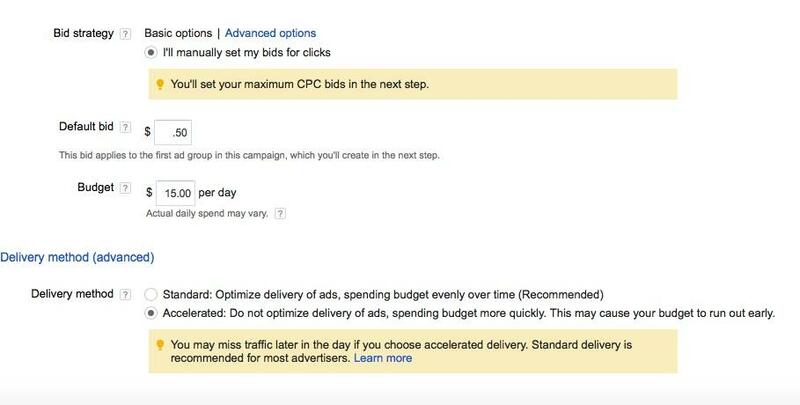 Google will show products based on campaign priority first and then bid second. So if the same product is in multiple campaigns with the same priority level, then the highest bid will win the impression. If the same product is in multiple campaigns with different bids and different priorities, Google will go with the higher priority campaign first. Networks & Locations. By default you will be opted into Google Search and Search Partners. Search Partners include sites like AOL and other Google properties like YouTube and Google Maps. Usually we recommend keeping search partners on to begin with as the results are often decent and CPC are usually lower than in the Google Search Network. However, you will want to come back and run some search network reports on this to be sure. Also, don’t skip the location portion or your ads will show up worldwide. Default Bid, Budget & Delivery. We’ll talk more about advanced bidding shortly, but you will need a default bid. We usually recommend in the $.10 to $.85 range depending on the price and competitiveness of what you are selling. Don’t worry too much, this this is just your default bid. This will only apply to products that you don’t specify a bid for later. Usually you’ll want to start out with a fairly conservative bid and watch performance closely. For delivery, we recommend using “accelerated” rather than the default “standard.” Accelerated delivery will get your products showing up faster and for all the queries that Google finds relevant for you. We’ve found that we can get data faster and find out sooner when campaigns need more budget with this setting. Linking Analytics & Setting up Conversion Tracking. There are two ways to do this. You can generate an AdWords Tracking code and drop that on your order confirmation page. Or you can pull in conversions from Google Analytics. Either way you will want to link Google Analytics to your AdWords account so you get Analytics data inside of AdWords and AdWords data inside of Analytics. To link your AdWords and Analytics accounts together click on the wheel in the upper right by your email address and account ID. 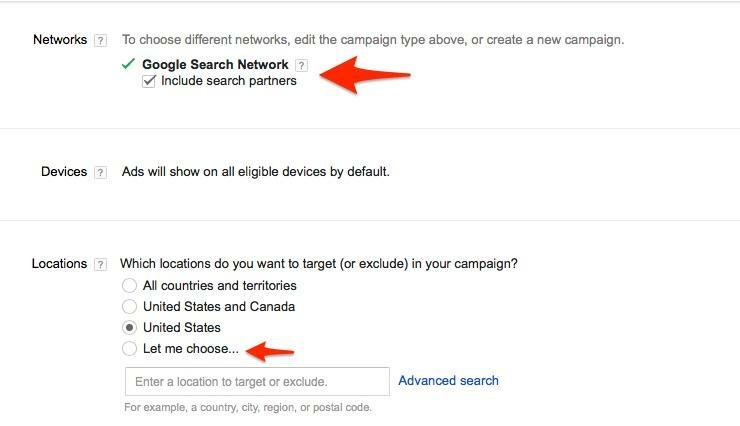 Then click on Linked accounts and Google Analytics and follow the steps. Then click on Merchant Center and follow the steps. You will need to have the same email address with admin access to AdWords, Google Analytics, and Google Merchant Center. 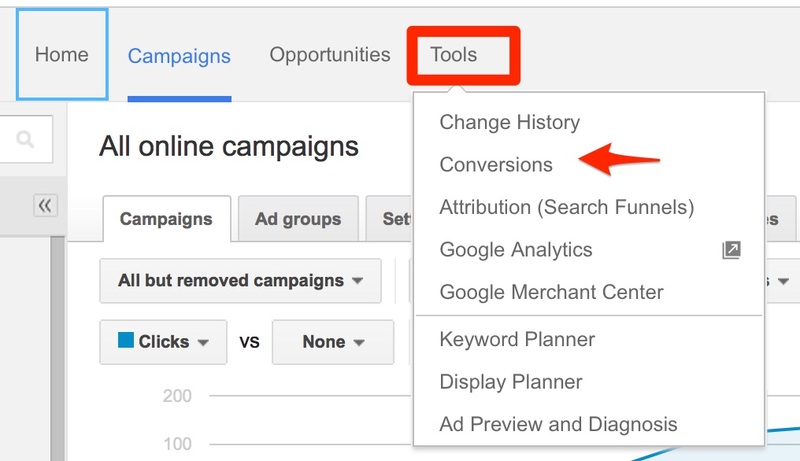 To create conversion tracking in AdWords click on Conversions under the Tools Tab. Then click the red +Conversions button and then choose Website as the source and follow the steps. We’ll get into the nitty gritty of Google Analytics reports in the Reporting & Optimization section (Ch.7). For now, I want to point out some of the reasons why you should connect Google Analytics with your AdWords account. More options for conversion tracking - We could get into a lengthy discussion on attribution models or how to determine what traffic source to credit for conversions, but let’s keep things simple. The important thing to note here is that in Analytics you can slice and dice your conversion data in lots of different ways. Often someone will visit your site more than once before buying. 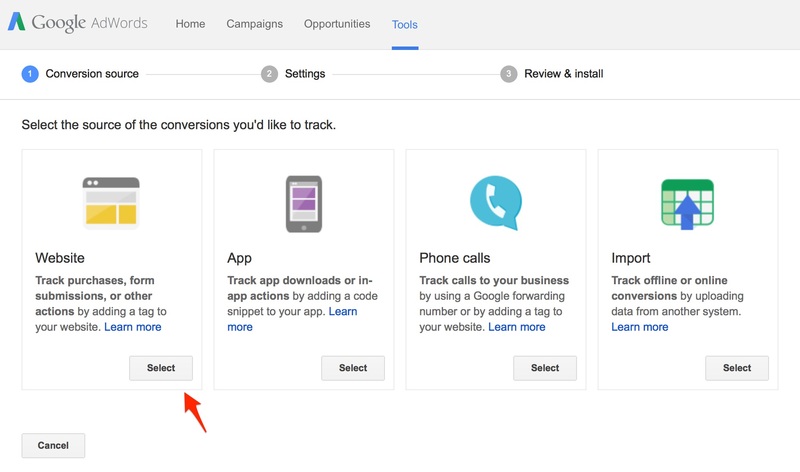 In Analytics you can see where your ad clicks occur along the path to conversion. Did someone click on your ad first, and then come back later from another source to purchase (first click). Or, did they click on your ad right before purchasing (last click). Google Analytics defaults to showing last-click attribution, or giving all of the conversion credit to the last click, but you can also see first-click and assisted conversions. Looking at the total impact on conversions is important as you evaluate Google Shopping as a channel. Customer engagement data - While conversions are the most important metric to show the success of your campaigns, it’s not the only data point you should consider. Looking at engagement metrics like time on site, average pages per session, and bounce rate can also shed light on overall performance. These additional metrics provide helpful insights into your onsite experience. Taken along with conversion data, engagement data provides a well-rounded picture of the vital signs of your site and campaigns. More on reporting later. First, let’s master your feeds. 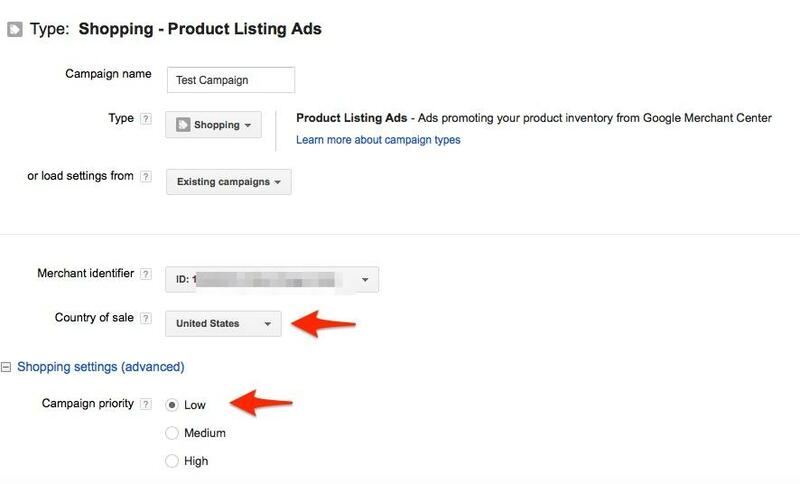 Remarketing lists - We’ll discuss remarketing lists and how they apply to Google Shopping in our RLSA section, but Google Analytics integration gives you ample opportunities to create new remarketing lists based on how users interact with your site. You can create lists based on pages someone visits (collection page, product page, etc. ), goals they’ve completed on the site (like filling out a form or watching a video), or even time they’ve spent on your site. As we’ll discuss later, having segmented lists rather than just an “all visitors” list, gives you more options for smart targeting later.